The atmosphere of Rosetta's comet 67P/Churyumov-Gerasimenko is far from homogeneous. In addition to sudden outbursts of gas and dust, daily recurring phenomena at sunrise can be observed. In these, evaporating gas and entrained dust are concentrated to form jet-like structures. 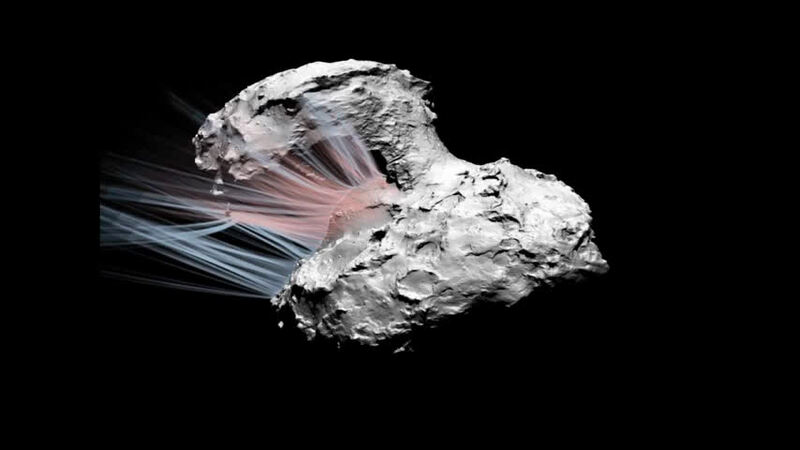 A new study, led by the Max Planck Institute for Solar System Research (MPS) in Germany and published in the journal Nature Astronomy, now identifies the rugged, duck-shaped structure of the comet as the main cause of these jets. Not only do concave regions collimate gas and dust emissions similar to an optical lens, the complex topography also provide some areas of the surface with more sunlight than others. Far from the Sun, comets are lifeless, ice-cold bodies. When they progress into the inner solar system, they become active: frozen gases such as water evaporate and entrain dust particles from the surface. In this way the coma, a shroud of gas and dust, is formed. Already in images from earlier cometary missions such as Giotto, which flew by comet 1P/Halley in 1986, distinct jets of gas and dust were visible within the coma. They reach up to several kilometers into space. For scientists, these jets are the key to cometary activity. When and where do they occur? Which processes on the surface are involved? And what do they reveal about the nature and composition of the comet? No mission has been able to pursue these questions in as great detail as ESA's Rosetta mission. From August 2014 to September 2016, the Rosetta spacecraft orbited comet 67P/Churyumov-Gerasimenko witnessing its transformation from an almost lifeless to a gas- and dust-spewing body from close-up. More than 70 000 images taken by the scientific camera system OSIRIS, which was developed and built under the leadership of MPS, document this process. They contain both eruptive, sudden outbursts of gas and dust, as well as jets that are stable for a longer time. In their most recent publication, researchers from the OSIRIS team have now investigated the activity that occurs regularly every morning. "When the Sun rises over a part of the comet, the surface along the terminator almost instantaneously becomes active," first author Dr. Xian Shi from MPS describes. "The jets of gas and dust, which we then observe within the coma, are very reliable: they are found each morning in the same places and in a similar form," she adds. Responsible for this early morning activity is the frost, which forms at night on the cold comet surface. As soon as the Sun's rays touch it, it begins to evaporate. "Outbursts can often be traced back to a small area on the surface where suddenly frozen water is exposed, for example due to a landslide," explains Dr. Holger Sierks from the MPS, OSIRIS Principal Investigator. "In the case of cometary activity at sunrise, this is different. The frost is distributed fairly evenly over the entire surface." But then why do the gas and dust emissions form jets? Why do they not create a completely homogeneous cloud? The new study shows for the first time that mainly the unusual shape and jagged topography of the comet are responsible for this phenomenon. 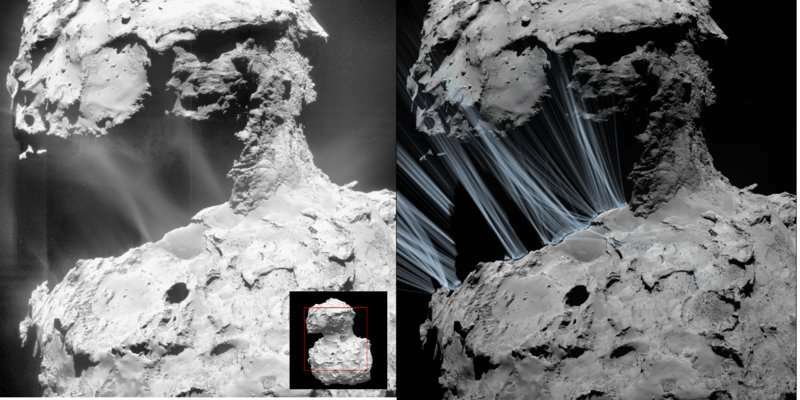 The researchers analyzed images at different observation geometries of the Hapi region located on the "neck" of the comet, the narrow part connecting its two lobes. In computer simulations, they were able to reproduce these images thus gaining a better understanding of the driving processes. In particular, two effects proved to be decisive. Some regions on the surface are located at lower altitudes or in the shade. The first rays of sunlight reach them later. In contrast, the frost evaporates particularly efficiently from the early and strongly illuminated regions. In addition, pits and other concave structures virtually concentrate gas and dust emissions - much like an optical lens. 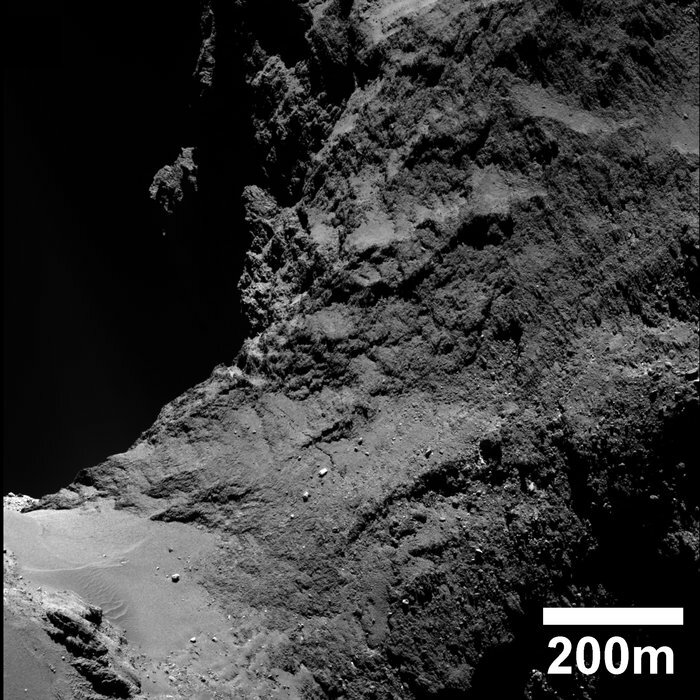 "The complex shape of Rosetta's comet makes many investigations difficult. But for this study it was a blessing", says Shi. On a spherical or even potato-shaped comet, these structures within the coma might not be as prominent. Gas and dust would be much more evenly distributed. In addition, the new study investigates the influence of the observation geometry. "Basically, every cometary coma is a three-dimensional structure, and each shot of it is just a projection," Sierks says. "Our images can therefore easily give a false impression." The daily recurring jets are particularly well suited to analyzing this effect, as Rosetta orbited the comet for a long time, looking at the sunrise over a particular region several times from different angles. Rosetta is a space mission of the European Space Agency (ESA), which reached its destination, comet 67P/Churyumov-Gerasimenko, in August 2014 and orbited it for more than two years. In November 2014 Rosetta deployed a lander on the comet. The Max Planck Institute for Solar System Research is the research institution worldwide with the strongest participation in the mission. Among other things, the institute leads the OSIRIS and COSIMA teams. But then why do the gas and dust emissions form jets? Why do they not create a completely homogeneous cloud? Due to the fact they are cold cathode jets, no magical duck shapes are required. Tubular! Though I have to remark Cant. That it would be more believable that the little green men inhabiting the comet. Where taking fiendish delight in shooting bottles of seltzer water at Rosetta. Yep! That works for me. Cause where are the x-ray emissions from what emitter, powered by what mechanism? "In addition, pits and other concave structures virtually concentrate gas and dust emissions - much like an optical lens." Holger Sierks, this is the best mainstream can come up with??? On a spherical or even potato-shaped comet, these structures within the coma might not be as prominent. Gas and dust would be much more evenly distributed. It's as if he'd never seen the collimated jets on every single comet observed. Or that cathode jets appear as jets. Didn't see any mention the dust is charged in this paper??? Think the teams should get together and not sit in separate offices. SO, WHY DON'T THE JETS ORIGINATE FROM VENTS? The jets originating from concave surface features is a bit of a misnomer. The jets CAUSE the concave features. This comet should be peppered with obvious vents. There aren't any because the model is wrong. Not in need of adjustment... wrong. Why do asteroids look like comets? Because they are the same. Why do asteroids sometimes exhibit cometary behavior? Because they are the same. This is a validated prediction of the EU 'pseudoscience' yet leaves the mainstream scientists dumbfounded. No dirty snowball here! Just hard, rocky, charged rotating bodies which spend most of their life away from the sun and very brief moments close to the sun. What an idiotic comment. Along with those of two other posters above. Don't you loons ever read any of the papers on such missions? Are you all thick? Just for the IQ deficient; there is no rock. As measured and observed. By CONSERT sending radio waves through the comet. By MIRO measuring the thermal inertia of the material. By measuring the sound waves from the hammering of MUPUS on Philae. By crashing a projectile into Tempel 1, and looking at what came out (ice, vapour and dust). So, just to make it perfectly clear for the hard of thinking - THERE IS NO ROCK! Idiots. Wrong. Rosetta also visited two asteroids (Steins & Lutetia), as have other missions. They have a considerably greater density than comets. The same MIRO instrument that looked at 67P's surface looked at theirs. Guess what the material's thermal inertia resembled? Rock. Guess what 67P's didn't resemble? Lol. EU non-science has never predicted anything correctly. This comet should be peppered with obvious vents. There aren't any because the model is wrong. No, no obvious vents or concavities in this image. Looks as flat as a billiard table! Didn't see any mention of the complete non-detection of electrical woo on the surface, or within the jets. Ergo, the idiotic EU 'model' is demonstrably wrong. Eh? The dust gets charged in the coma. Cathode jets! Lol. What do these 'cathode jets' consist of? What is their temperature? What velocity? What spectral signatures? Loon. They are measured to be cold, H2O and CO2 vapour and dust, for the most part. Sometimes they even have solid ice grains within them. 'Cathode jets'! Deary me. Idiot. If a surface is concave, what happens when the vapour is sublimating from the middle of the concavity? And what happens when it originates from the outer part? Want me to draw a piccy for you? So, let's hear the science, loony tunes. How is a cathode jet moving neutral species? More ignorant BS from uneducated EU wooists! The paper has 45 authors, one of whom is Jessica Agarwal. Learn to read. Nope, just setting straight a bunch of pseudoscientific, evidence-free, impossible woo, as promulgated by EU loons. NASA does not deny electric and magnetic fields are involved, more would have been learned if the lander had succeeded in landing. Next time they'll know not to plan for an icy surface though. And they have known about the solar wind interaction since before the idiots Thornhill and Talbott started their silly little cult. And the surface is icy. It most definitely isn't rock. I guess you didn't read the papers. Either that, or you didn't understand them. It's more than clear that the interaction of the comet with the solar wind is an electric discharge process. There is no explanation for the observed complexity if we're just discussing a melting dirty snowball. Amusingly, note the lower part of the diagram indicates the "bi-directional electron streaming"... jonesdumb will claim that is the other "bi-directional" though. Idiot. There is plenty of explanation of how the solar wind interacts with a comet. None of them employ the lunacy advocated by the idiot Thornhill. Please tell us what that image has to do with the solar wind. Bear in mind that the solar wind isn't getting close to the comet for long periods around perihelion. What is your mechanism? Where is it spelled out? What is the evidence for it? Go. Amusingly, note the lower part of the diagram indicates the "bi-directional electron streaming". Really? I see no mention of the words 'electron' or 'bi-directional', either in the caption to the image, the video, or in the paper. In which case I assume you've made that up. What you are seeing in that image is dust, woo boy. And the dust is entrained within neutral gas. As observed, as measured. Please explain to the boys and girls what you think you are seeing. Science by pareidolia. Not unusual for EUists. The real science is usually beyond them. I sometimes wonder: Is there an estimate somewhere how much mass such objects accrete during their time far away from the sun. Space isn't entirely empty and they do have a (weak) gravitational attraction. It's more than clear that the interaction of the comet with the solar wind is an electric discharge process. Lol. And where, pray tell, has this electric discharge woo been measured? We had a spacecraft with the very instruments to detect such things around the comet for two years. We landed one craft on the comet. And then slowly crashed the other one. There are hundreds of papers from this mission. Which one has seen an electric discharge? You know, as in the unscientific crap as advocated by the woo merchant Thornhill? EDM (lol)? Glow discharges (lol)? Sorry, but you've been taken in by a bunch of scientifically illiterate Velikovskian nutjobs. You only make yourself look stupid by repeating such idiocy here. I've never seen such an estimate, but there are estimates for how much mass 67P lost over one orbit. I'd have to search for it. About 10^10 kg, mostly as gas. which sees a lower figure of ~ 3 x 10^9 kg. The mass of the comet is ~ 10^13 kg. F*ck off. You have no idea about comets. Do not pretend that you do. Moron. It's an excellent article RC, my guess is jonesdumb will choose willful ignorance and avoid it. His response above speaks volumes about his character and intelligence. Back in the 50s Biermann postulated about the solar wind, and, in particular, how it might behave at a comet. In '57 Alfven wrote a much referenced paper about how the SW and its magnetic field would interact with a comet. He was pretty much right. Experiments, involving the release of Barium/ Lithium, into the solar wind, in the AMPTE experiments, in the early 80s, confirmed much theory. Missions to Halley confirmed even more. 20 years later, an idiot called Thornhill wrote a bunch of sh*te, Some cretins believe it. And has f^ck all to do with comets, woo boy. How dumb do you need to be? IQ of a brain damaged trilobite, I would guess. Eh? Hey, thicko, how ya doin'? Please point us to a paper from the Rosetta mission that backs up your idiotic woo. Just one. Trust me, such a paper doesn't exist, loony tunes. Stop being thick, just for a few minutes, and actually try to outperform your IQ of < 70. Please point us to a paper from the Rosetta mission that backs up your idiotic woo. "The recent discovery relates to the layer, the so-called plasma-wall sheath of electrical charge that surrounds objects, including diagnostic probes, inside the plasma, which is composed of charged electrons and ions. This layer protects probes by repelling other electrons in the plasma that affect the measurements of the instrument and sometimes even cause damage." "the layer's charge can sometimes be positive, contradicting what scientists have long thought—that the blanket always has a more negative charge than the surrounding plasma." Basically, everything you profess is likely wrong. Actualy, how strong were those grappling hooks? What article? That is about fusion devices, you prawn. It has zilch to do with comets. As measured, dumbo. The only frigging plasma around a comet for long periods is that which is emitted by the comet. And that is overwhelmingly neutrals. And, by definition, as everything started off neutral, the few ions and electrons balance themselves out. There is no charge. None of your idiotic EDM (lol) woo. Only somebody who is scientifically illiterate could have come up with the loopy electric comet idea, and only people with a vanishingly small grasp of the relevant science would be conned by it. You're letting your emotional involvement get the better of your intellectual objectivity, jd. No, I'm not woo boy. There have been many hundreds of papers from this mission. I own, and have read, a large percentage of them. Nothing in your irrelevant article is germane to comets. So, how about going away and educating yourself in the relevant areas before making a fool of yourself again, huh? The article is about objects immersed in plasma, just as comets are immersed in plasma. Of its own making for much of the time. The solar wind was not getting within 1500 km a month or so after perihelion. So, the neutrals (mostly H2O) outnumber ions and electrons by ~ 1 million to 1. There is no EU woo going on there. Of its own making for much of the time. The solar wind was not getting within 1500 km a month or so after perihelion. So, the neutrals (mostly H2O) outnumber ions and electrons by ~ 1 million to 1. You are a moron! It's a simple fact, comets are immersed in plasma. Your incorrect claim that the solar wind isn't getting within 1500km doesn't change the fact that comets are immersed in plasma. And you are a f***wit! Want me to link to the paper that shows that the solar wind is getting nowhere near the comet for many months? Idiot. Earlier, when at 1500 km, i.e. at the furthest distance from the nucleus during the excursion, the solar wind was not seen at all. There we go. My 'incorrect' claim seems to be right! Surprise surprise. Edberg, N. J. T. et al. Of course, 1500 km is just a minimum distance at which the solar wind was held off. Just read the papers, instead of making up nonsense. The freezing - refreezing was just the theory, now it needs another one. Nothing was said at time, but there was landslide material recorded at the time in the valleys, it just didn't seem the right moment to mention it and all that. ^^^^^^^^The harpoons and ice screws failed to deploy. It was estimated that Philae landed in about 10 - 20cm of dust, above a harder layer. The reason for landslides from cliffs is mostly (probably) due to continual thermal contraction and expansion. On cliffs this material has somewhere to fall. A flat surface is likely to be covered in an insulating layer of dust. Obviously, that cannot happen on near vertical cliffs. On less dust covered flat areas, thermal contraction polygons are seen which very much resemble those seen on Earth and Mars in permafrost areas, and elsewhere.